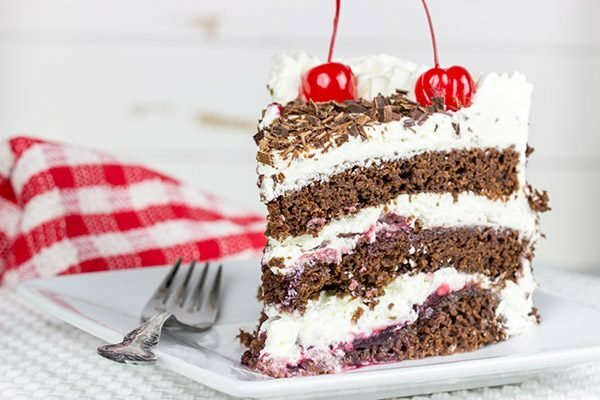 Featuring layers of chocolate cake filled with cherries and fresh whipped cream, the Black Forest Cake is a classic (and delicious) dessert! As a Roman history buff, I’m familiar with the Black Forest region in southwestern Germany. The Romans called the Black Forest ‘Silva Nigra’ (literally ‘the dark woods’), and the Roman legions viewed this area as a place to avoid. Germany represented the far reaches of the Roman empire during the time of Augustus (27 BC-14 AD), and the barbaric Germanic tribes caused quite a bit of trouble for the Roman expansion efforts. (Indeed, the Battle of the Teutoburg Forest, located north of the Black Forest region, led to the massacre of 3 entire Roman legions.) But for all of the Romans’ warnings to avoid the Black Forest, it is actually quite a wonderful place to visit! But back to our river cruise. I’d never been on a cruise before, so I didn’t know what to expect. Blown away doesn’t even begin to describe that experience! We sailed from Amsterdam to Basel, Switzerland, and I seriously could take the same trip again. This was an incredible trip, and I highly recommend it to anyone thinking of doing a river cruise. 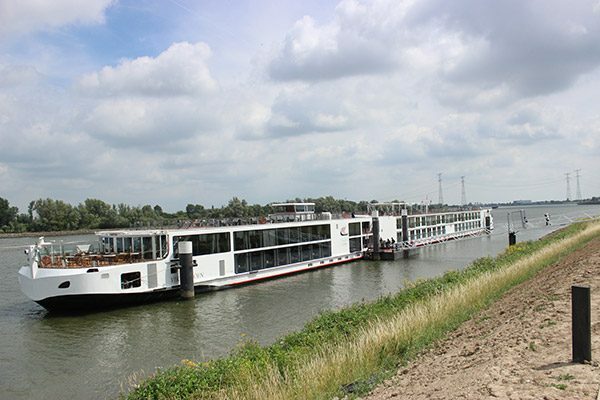 We were blown away by the staff and service on the Viking Lofn (our boat was named after the Norse goddess of comfort), and it was great to spend time with my family as we wandered through the Rhine River valley. I’ve got a bunch of fun recipes lined up in the coming months featuring different stops along this vacation, and first up is the Black Forest. (Actually, I’m doing this in backwards order as we visited the Black Forest on our last full day of vacation. But I really wanted to try my hand at making an authentic Black Forest Cake, so this post got slipped up to the front!) 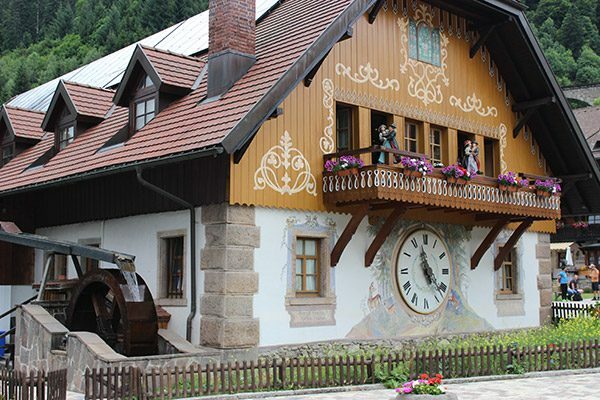 The Black Forest is a picturesque region of wooded mountains and gorgeous valleys…and it’s also home to cuckoo clocks in addition to Black Forest Cake. On our visit, we took a coach from our boat up to Hofgut Sternen, a small town high in the mountains of the Black Forest. In town, we watched a short demo of how cuckoo clocks are made, and then we made our way downstairs to learn more about Black Forest Cake. 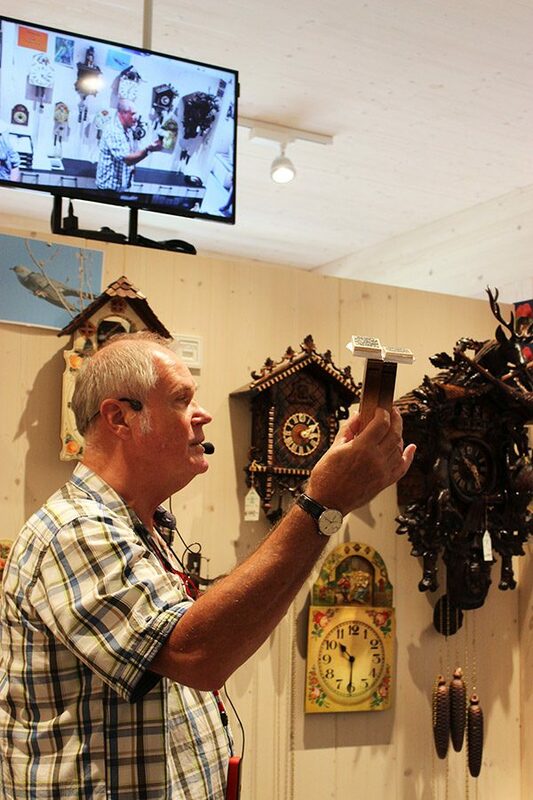 Yes, we totally shipped a cuckoo clock back home from the Black Forest, and it’s hanging in our family room. Robbie loves to yell “CUCKOO” at the top of his lungs every time the bird pops out! And, yes, we totally ate a slice of Black Forest Cake in the Black Forest. I mean, when in Rome, right? While nibbling on our slice of cake, Laura and I shared a small glass of kirsch. What exactly is kirsch? It’s a colorless brandy made from the Morello cherries which are common in this part of Germany. Unlike other liqueurs, kirsch is not sweet. 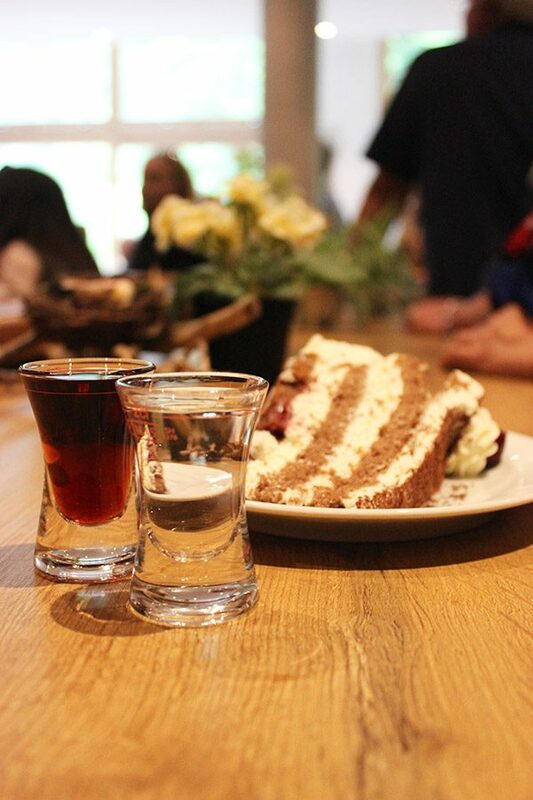 In fact, the guy doing the demo of the Black Forest Cake gave us a glass of kirsch and a glass of cherry brandy. He told us “One is for when you wake up, and the other one is for later.” We asked which was which, and he just told us “You’ll find out.” I’m pretty sure the sweet cherry brandy was meant to be the ‘wake-up’ one, although I’m not quite sure. I’ve since learned that kirsch is typically served ice cold as an after-dinner digestif. Those crazy Germans with their brandy for breakfast! 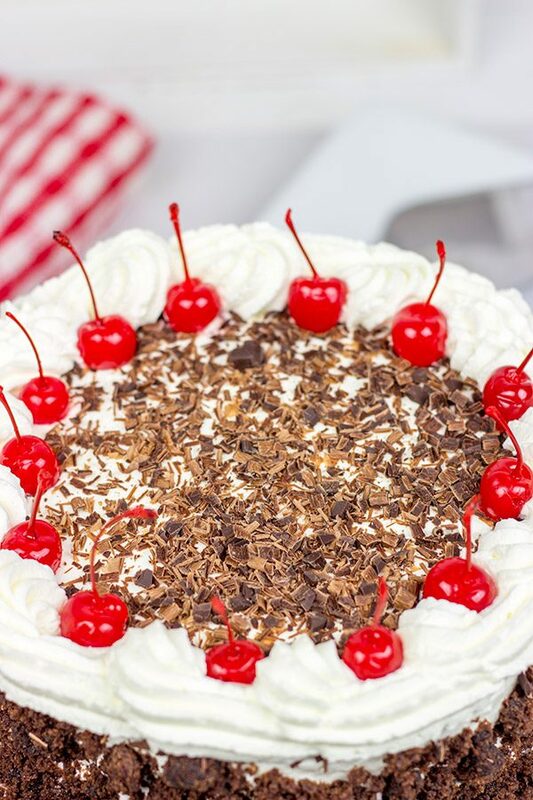 If you’re looking for a fun dessert, then this Black Forest Cake should go on your list! It’s chocolate. And cherries. And whipped cream. How can you go wrong there? 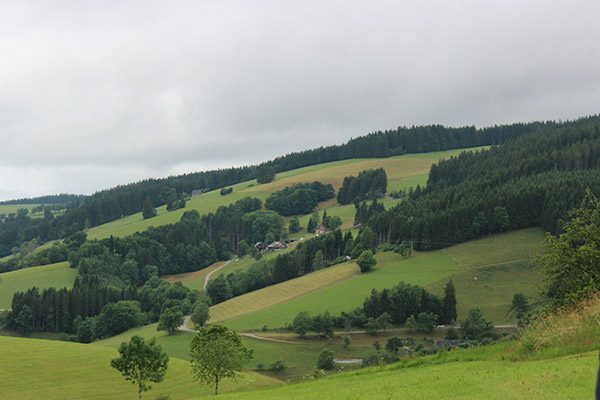 And if you ever get the chance to visit the Black Forest region in southwestern Germany, do it! Grease and flour (2) 9” round cake pans. Line bottoms of pans with parchment paper and set pans aside. 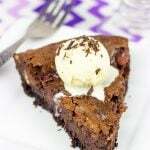 Using a large bowl, add the flour, sugar, cocoa powder, baking powder, baking soda and salt; stir until well combined. In a separate bowl, add eggs, milk, oil and vanilla extract; stir until well combined. Divide batter evenly into the 2 prepared cake pans. Bake for 32-35 minutes, or until a toothpick inserted into center of cake comes out clean. Let cakes cool for 10 minutes before turning out of pans. Place cakes on cooling rack until completely cool. Drain cherries, reserving ½ cup of liquid. Using a 2-quart saucepan, combine cherries, ½ cup of liquid, kirschwasser, sugar and cornstarch. Stir until well combined and place over medium-low heat. Cook, stirring often, for 10-12 minutes, or until sauce has thickened noticeably into a gel-like consistency. Remove from heat and stir in vanilla extract. Set sauce aside to cool completely before using. Meanwhile, using an electric mixer, whip the whipping cream and powdered sugar together until stiff peaks form. Remove 1½ cups of whipped cream and set aside for decorating cake. Using a medium bowl, crumble one of the four layers apart into crumbs; set aside. Place one layer of cake on a large platter. Spread 1½ cups of cherry filling on top, then spread 1 cup of whipped cream on top. Repeat process with the second layer of cake, using ½ cup of filling and another 1 cup of whipped cream. Finally, place third layer of cake on top. Frost top and sides of the cake with the remaining whipped cream. (Note: Do not use the reserved whipped cream from above yet.) Pat reserved crumbs into the sides of the cake. Using a piping bag fitted with a large star tip, garnish the top of the cake using the reserved whipped cream from above. 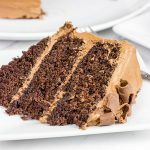 Using a sharp knife or vegetable peeler, grate chocolate into curls and shards on top of the cake. Garnish with maraschino cherries. 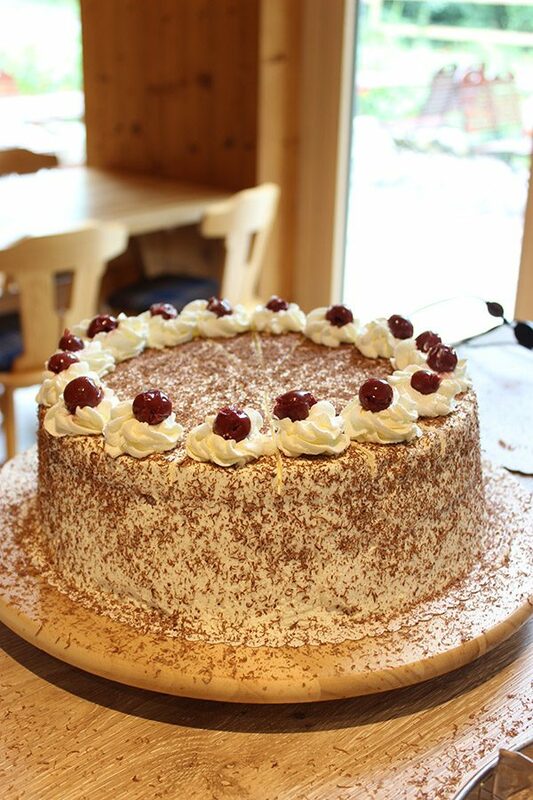 Recipe from Hofgut Sternen: the Black Forest Village. I couldn’t find canned sour cherries (only cherry pie filling which is not the same), so I used a 24-oz. bag of frozen cherries (thawed). Kirschwasser (also called kirsch) is a fruit brandy made from fermented cherries. It was originally created in the Black Forest region of Germany, and it is a key component of a traditional Black Forest Cake. I recommend only using half of the cherry filling in the cake. Using all of the cherry filling will make the cake difficult to slice. I also recommend using most of the cherry filling on top of the bottom layer of cake. 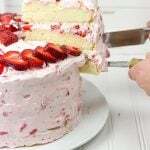 The weight of the filling on the upper layers of cake will make this cake difficult to slice. (This was a tip shared directly from the baker that we talked to at Hofgut Sternen.) Use the extra filling as a topping for ice cream…or just eat it plain! In order to prevent the whipped cream from melting, ensure that both the cake and the cherry filling are totally cool. I actually placed mine in the refrigerator for about 30 minutes to make sure the cake and filling were cold. Such a classic cake! Yours looks amazing, look at those layers! Sounds like you had a great trip. Wow, it looks like you had a great vacation. This black forest cake looks really yummy. I love the combination of chocolate and cherries. We really did have a great vacation! We missed Robbie, but it was great to have some adult time…and sleep in past 6am for a change! 🙂 Thanks so much for the kind words, Dawn! Looks like you had such an amazing time! I’m always blown away by how beautiful Germany is–kind of like the Pacific Northwest but fancier because it’s Europe. I’m wondering if the kirsch was meant for breakfast, since I think (?) kirschwasser translates as cherry water. . .maybe they don’t realize it’s alcohol :). This is one fantastic cake. I’m down for anything chocolate, with a cherry on top. Happy Friday! Haha! I agree that everything in Europe is just fancier. Why is that? I’m also pretty sure I could just move to Europe. I absolutely love visiting, and I’d get up and go back this very minute if I could! 🙂 As far as kirschwasser for breakfast? That would be one heck of a way to wake up each day! You wouldn’t be groggy after a shot of that one. Hah! Thanks, Kelsie…I hope you had a great weekend yourself, my friend! Haha! I’m not sure you can go into a sugar coma just from looking at photos, right? I mean if looking at photos of food involved calories, then we’d all be in a lot of trouble! 🙂 I agree that Viking is expensive, but it’s definitely worth saving up for the experience. And they often run the 2-for-1 specials which is a great option. Either way, dreaming is half the fun, right? And do give this Black Forest Cake a shot. I’m not sure if you can find kirschwasser in your area, but do try to find it. There’s just a little bit in the recipe, but it absolutely adds a unique flavor! Thanks so much for the kind words, Dorothy…you’re the best!! Oh, that trip really was amazing, Ben! I’d never been on a cruise before, but I have to say that I’m sold. River cruises are where the fun is at! 🙂 In fact, we passed a bunch of cargo ships on the river. Maybe one of them was you Dad? Haha! I totally get that about using the flavors of a classic dessert in other ways…and then never making the actual classic. 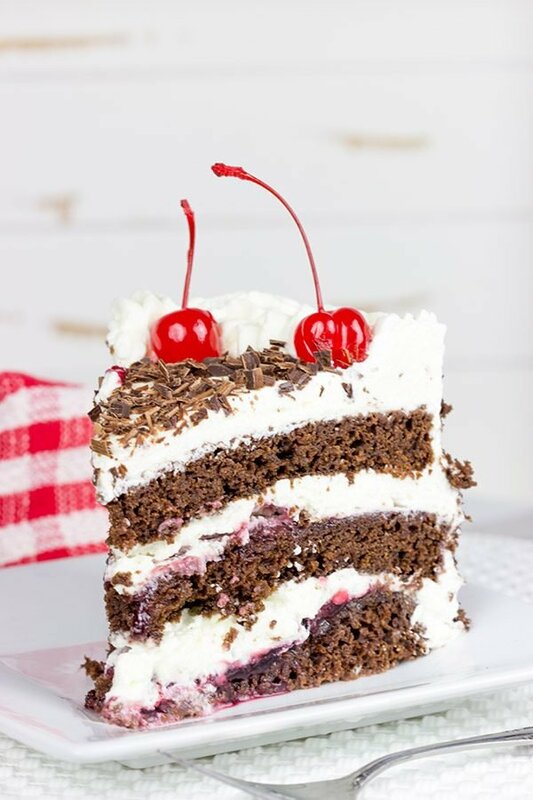 But this Black Forest Cake is an absolute classic! 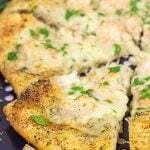 The recipe came straight from a small town in Germany, and it’s a winner for sure. In fact, we froze a few slices, so I can ship you one…if Laura let’s us part with it! 🙂 And I’ve got some more trip-inspired posts in the wings ready to be made. I might just need to send you samples for feedback before I post them. Thanks so much for the kind words, my friend! Happy Monday! You always have the best looking desserts – this cake is beautiful & looks delicious! I’m not usually a big cruise person, but the cruise you went on sounds really fun. I’m sure it was tough to leave the kiddo behind, but it’s great that you got in an adult vacation & enjoyed it! This cake is gorgeous! I love that you took an adult trip! It’s great taking vacations with the kiddos, but sometimes you just need some adult time. He probably had a blast at grandmas. I love all the fluffy layers and the cream filling! Thank you so much, Kathy! Laura and I truly were torn about the adult trip thing. We really missed Robbie a ton, but it was so, so nice to just relax on the boat, too. And it totally helped knowing that he was enjoying hanging out with Grandma the whole time! 🙂 Also, this cake is amazing. Seriously. If you get a chance, give it a shot! Hope your week is off to a great start…not too much longer before school starts back again! I don’t know how I missed this black forest cake. I actually visited the black forest in Germany and it was CREEPY! A few locals explained to me the locals are very familiar and comfortable in the forest, they actually say it’s safer than being in a big city. In my mind the forest is crazy scary, I felt like we were in a fairytale gone wrong. I’ve always wanted to take one of those Viking River Cruises. I’m going on a cruise in November and I’m super excited. Look at all the adorable cuckoo clocks. 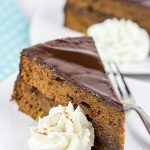 Sadly I didn’t have a piece of this delectable cake while visiting Germany so this recipe will come in handy. You’ve visited the Black Forest, too? I agree that it was kinda creepy how dark the forest itself was, but the area was absolutely beautiful! I do feel like I’ve heard some stories over time about that area being haunted and whatnot. That didn’t come up on this trip, though. But we did nom nom on Black Forest Cake! 🙂 And you should definitely keep Viking River Cruises on your radar. We were blown away by the entire experience, and honestly we’re already thinking about the next river cruise we want to take! Thanks so much, Mary!! wow, sounds like you had an amazing trip David, the pictures are gorgeous! 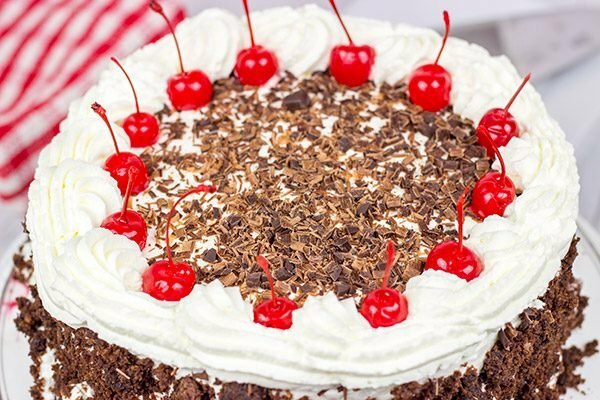 Black forest cake is quite popular in India too! This looks so moist! yum! Why thank you so much, Manali! We did indeed have an amazing trip, and I had a blast writing up this post. Reliving the memories after a fun vacation is one of the best parts! And I had no idea Black Forest Cake is so popular in India. I wonder why that is? Either way, it is indeed delicious! Thanks so much, my friend! Oh wow! I absolutely adore Black Forest Cake. And I loved reading about your river cruise (sending this to Lynne to add as another idea to our ever growing bucket list! I can’t wait to read more about your trip David! Now the cake, what an outstanding specimen. Absolutely perfect!! It reminds me of the black forest cake my brother and I ate whilst camping in this region in Germany oh so many years ago, but the memories are flooding back. It was a daily treat as we headed into the local towns on a daily basis to purchase groceries from the local markets and to find the local cake shop. Brilliant. Now I MUST go back! And Black Forest Cakes are such an incredible dessert! They are so iconic to that region. I can’t even imagine how fun that would have been to go into town each day and hunt down the local cake shop. 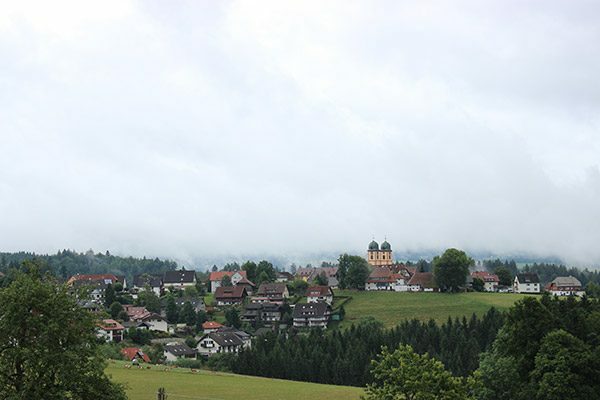 We loved our time in the Black Forest, and it’s definitely on our radar to go back at some point. And, yes, there are a bunch more posts in the works inspired by our Rhine vacation…stay tuned! (They lend themselves more towards holiday baking, so I’m holding off for a couple of months there…it’s so hard to wait since those posts are just fun to write!) Thanks so much, my friend! This is one hell of a cake, David! 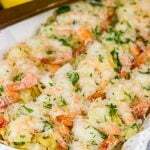 I would love to prepare and taste it as soon as possible! Black Forest is one of my favorite cakes, and the Black Forest is one of my favorite places. I usually avoid Black Forest cake, even though it’s a favorite, because it’s so often made with canned cherry pie filling. Thanks for showing us a truly authentic one! I’m also a fan of kirschwasser. Try a shot of it in a glass full of homemade lemonade! Yes! I was so disappointed when I went to the store and couldn’t find canned cherries. I only found cherry pie filling. I actually picked up the can, and then I was like “I can’t do this.” So I called an audible and went to the frozen aisle and grabbed a bag of frozen cherries. The ones I found were a mix of sweet and sour cherries, but they were close enough. And kirsch. That stuff is intense! But now I’m intrigued by the idea of putting it in lemonade. I’m gonna try that this weekend! i’ve never been on a river cruise! but as someone who spent her last cruise miserable and perpetually nauseous, i think a slower river would be much more my pace than along the pacific ocean. also, anyone who prioritizes black forest cake is doing something right in my book! Pardon my ignorance! But I didn’t know there was a Blackforest region somewhere! !This is one of my favorite cakes! Definitely a classic cake with delicious flavors!! I love the generous cherry filling between the layers and I am sure the kirsch lends a distinct flavor. 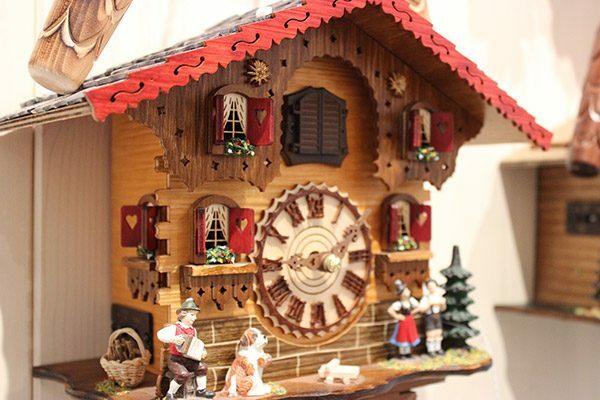 P.S I would also jump in joy if I had a cuckoo clock at home :)! Oh that’s not ignorance at all, Deepika! That’s the wonder of the internet and blogs…I’m always learning new things, too! 🙂 So the Black Forest region of Germany is beautiful (even if it sounds kinda creepy), and the Black Forest Cake comes from that region. But don’t leave out the kirsch if you are able to find it…it really does add a distinctive hint of flavor, and the cake wouldn’t the same without it. Oh, and that cuckoo clock? We love it!! Robbie loves watching the bird, and then saying “bye bye birdie” when it’s done cuckoo’ing. Haha! Hope you had a great weekend, my friend! So so loved reading about one of the stops on y’alls cruise and cannot wait to read all the other posts as well! 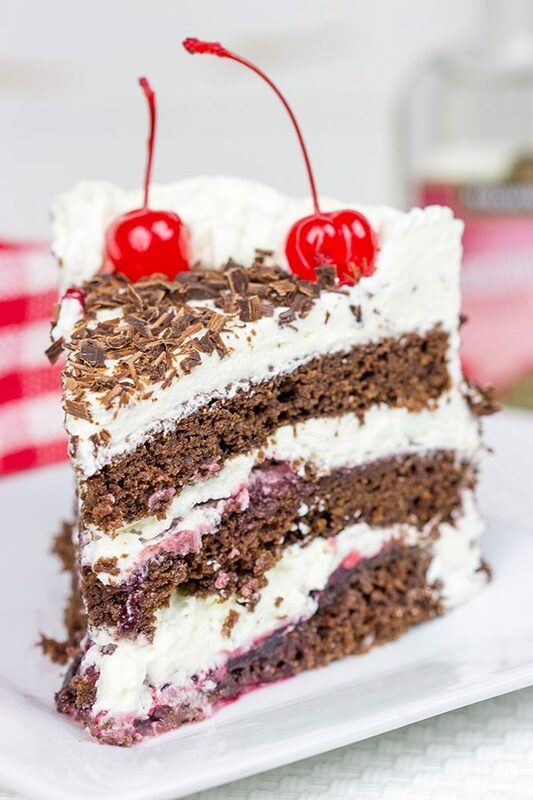 Enjoying a slice of Black Forest Cake IN THE Black Forest makes for one epic line – especially for me as until today I didn’t even Know The Black Forest was a legit place – all I ever pictured was cake + whipped cream + cherries every time I heard it! GAH! My dad used to LOVE cuckoo clocks – like Robbie, he’d often yell out “cuckoo, cuckoo” every time he’d hear one! Such a classic! A cake this delicious never ever gets old… like, ever. 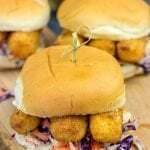 Need to make one of these soon! Your cake looks wonderful! I’m planning on making a Black Forest Cake this weekend. My sister just returned from the same cruise and brought me the Hofgut Sternen recipe with a bottle of Kirschwasser Schnapps. I was looking at your recipe as the recipe I received is all in ounces, and I don’t want to convert to cups and tablespoons;) What I wanted to let you know is that Aldi’s Supermarket (a German company here in USA) sells 24oz jars of Dark Morello Pitted Sour Cherries in syrup.